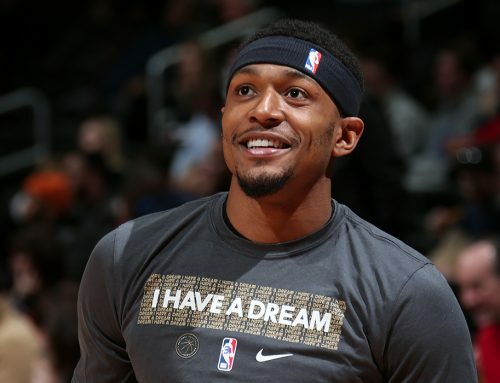 Bradley Beal and the Washington Wizards dominated a key weekend in the Eastern Conference playoff race, including taking down the team at the top, the Cleveland Cavaliers. Brad recorded 19 points, three assists, one rebound and one steal in 25 minutes on 7-of-13 from the field in a 129-108 rout of the Nets. On Saturday in Cleveland, Brad showed out against the defending champions, posting 27 points, six assists and four rebounds in a decisive 127-115 victory, moving just 2.5 games back of the Cavs in the East. Brad started his night against Brooklyn with a trey off a bullet feed from John Wall to cut the Nets lead to one with 4:25 to go in the opening quarter. A minute later, BB stepped back to hit a midrange jumper to keep the deficit at just one. In the second quarter, the Wizards’ bench unit turned the game around and opened up a big lead for the home team. Early in the third quarter, the former Florida Gator hit another midrange jumper and one at the free throw line to extend the advantage to 22. With 9:03 left in the quarter, No. 3 found Wall on a full-court one-handed touchdown pass for a dunk. Bradley later took a pass from Wall and converted a beautiful, hanging and-one layup over Jeremy Lin. Brad ended the quarter with two smooth midrange jumpers to keep Washington in front. The Wizards’ potent bench unit finished off the game in a lot of garbage time as Washington rolled to the win. After beating the team at the bottom of the East, Brad was looking forward to the team at the top. The next night in Cleveland, Brad hit his first shot from beyond the arc to give the Wizards an early lead before sinking a jumper off a screen from Marcin Gortat. Later, BB took a sweet bounce pass from Gortat and hit a feathery floater in the lane before dishing a gorgeous drop-off dime to Otto Porter Jr. for a layup. Later, Bradley took Tristan Thompson off the dribble and connected on a step-back jumper. In the second, the star shooting guard made another sweet jumper after a step back move then delivered two pretty passes to Gortat for a layup and a huge dunk in the lane. At the start of the second half with the lead at eight, Brad took a rebound coast to coast for an and-one layup in traffic to extend the lead to double digits. Early in the fourth quarter with the lead down to five, No. 3 hit an open trey and followed it up with a jumper in the paint to keep the Cavaliers at bay. With just over a minute remaining and the lead back to ten, BB hit a beautiful step back jumper to ice the game for the Wizards. 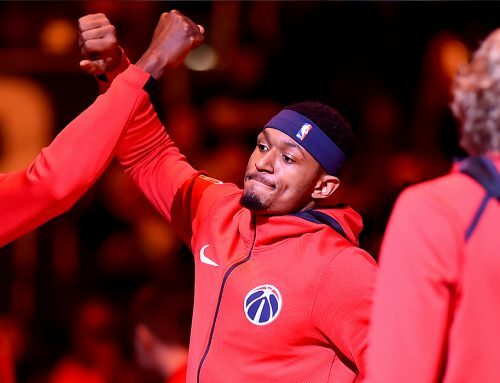 Bradley Beal is cold. Smooth as heck. Been averaging 26 a game since the All-Star break. Should really end up a top, top player. 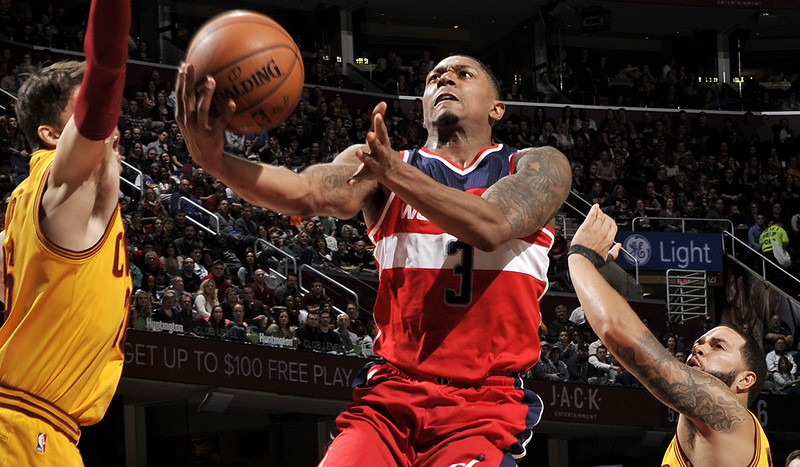 Bradley Beal is the key. If he stays healthy and drops 20 plus a night they are going to be hard to beat. D.C. travels to Los Angeles to face the Lakers on Tuesday, March 28 on NBATV. Bradley will try to help the Wizards sweep the short season series against their coastal rivals as they currently lead it 1-0. 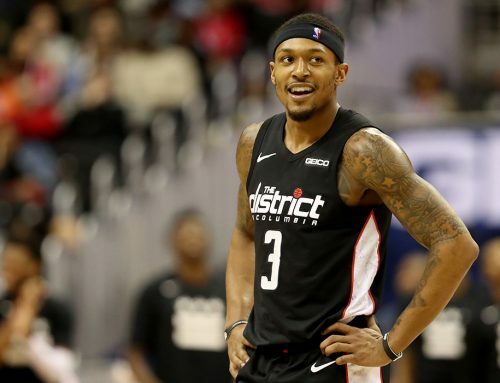 In the first meeting, Brad had 23 points, four assists, two steals, one rebound and one block as the Wizards won 116-108 in D.C.
Washington comes into this game just 2.5 games back of Cleveland and Boston who are tied for the top seed in the Eastern Conference playoff picture. Tipoff in Los Angeles is set for 10:30 p.m. ET.